Jake will not only wag his tail, but his entire body when he is happy to see you! He is very well mannered, and is equally happy on a walk, as he is snoozing at your feet. He enjoys the job of being a human companion. He currently is living happily in a dog center with up to 20 other dogs, but he is a bit of a policeman and doesn't care for hyper, ill behaved dogs! He has been around horses, and cats---although eratically, so adopter should be prepared to further his training. He walks well on the leash and is house broken. 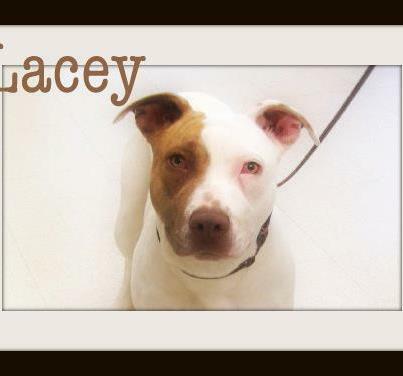 Lacey is everything a knowledgeable pit bull owner would expect from the breed. She is loving, loyal, and a soft, squishy ball of love! She enjoys playing with balls and interacting with adults. She does not enjoy children, and was unfortunately allowed to develop some bad habits living on a ranch as a pup, so she should be in a cat/livestock free home. She gets along nicely with dogs her size, and will be a joyful addition to an adult home! Tango is a goofy, happy, snorty boy who had a home, but sadly lost it when his family lost their house and couldn't find a rental that would allow a pit bull. He is a wonderful family dog, great with kids, and other dogs. He is house broken, and well mannered. He is also a big, strong boy, so continued training would be a good plan. 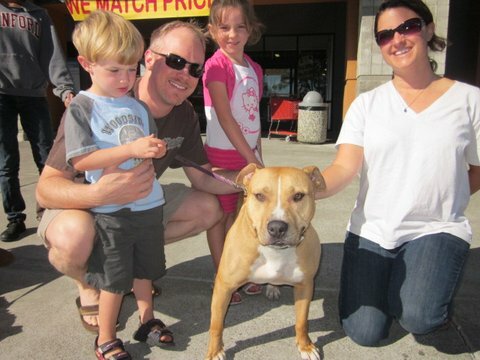 Radar is yet another dog that lost his home when his owner lost their housing. He has been looking for a home for over a year and a half, but because adoptions are exciting for him and he can look intimidating when excited, he is having trouble attracting potential adopters. This is unfortunate as Radar is a loving, responsive dog who really truly wants a human to call his own! He enjoys one on one training and knows many commands. His previous owner states that he was housebroken. He currently resides in a dog center with many other dogs, but would really love to start a life with an active owner and enjoy the comfort of a home routine. THESE ARE ALL DOGS IN THE CARE OF ANDERSON VALLEY ANIMAL RESCUE, PLEASE CONTACT BECKY IF YOU WOULD LIKE MORE INFORMATION ON A DOG OR IF YOU HAVE INTEREST IN BECOMING A FOSTER FOR A RESCUE DOG. Cuesta has the long legs and the stunning ice blue eyes of a super model. 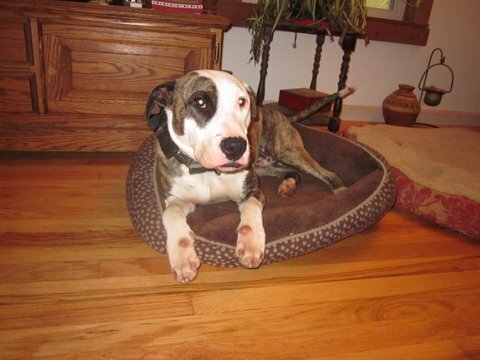 She is well mannered, house broken, has basic training, and is good with other dogs. She can be shy and aloof with new people, particularly men, but rewards the patient person with a strong bond. Cuesta can be timid and does best when she has a 'mentor' dog, a dog that is confident in it's routine, to show her the ropes. Cuesta is true to her husky roots and can be an escape artist. Her adopter needs to have a tall fence! 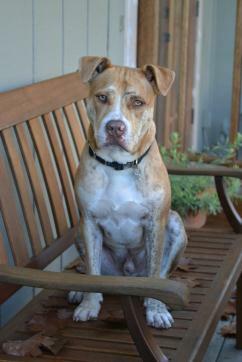 Cuesta is currently in foster care with many other dogs, where she is a welcome visitor. 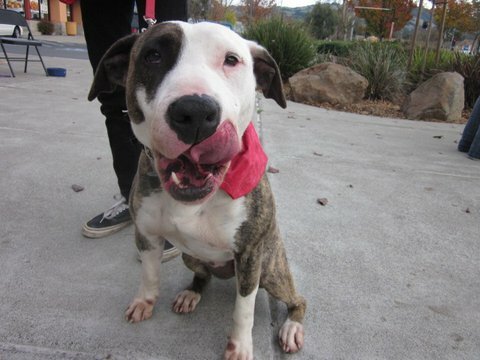 However, she is eager to end her year long search and begin a life in her forever home! Tanner is a dorky, goofy lovable boy. He has been fostered by Becky at Paradigm Sporthorse for the past 6 months and is an excellent barn dog. He is well behaved with cats, dogs, chickens, horses, and children (although he is still a bit of a clutzy puppy so not the best choice for really young kids). He loves going for trail rides, hikes, and gives Michael Phelps a run for his money in the swimming department! He is also a complete cuddle bug and will melt if you give him an invitation. Tanner is house broken, has basic training, rides well in a car, and has excellent recall (unless he is swimming---then time better be on your side!). Tanner was rescued from a kill shelter when he was 4 months old. Initially he would growl at new people because he was scared. Now he hangs out at the stable and greets newcomers without issue. If you sit down he will ooze onto you. 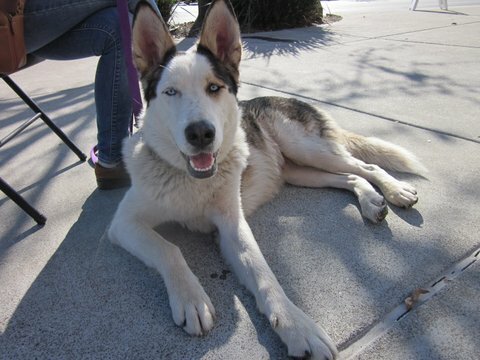 However, it is reasonable to expect that his adopter may have to work with him as he adjusts to his new home. He is not an aggressive dog and wants more than anything to be his person's best friend.